Thumpity thump thump -- here come Peter Cottontail! 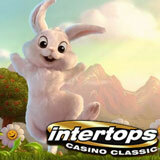 Intertops Casino Classic begins its Easter celebrations on Monday with the first of three special freeroll slots tournaments. The three freeroll slot tournaments will each award $1000 in prize money. Just make it to the leaderboard and you'll get a $25 bonus deposited in your account! A $100 deposit bonus is available until the end of April. To receive 50% extra when you deposit enter coupon code FREETHEBUNNY at the cashier. There is no entry fee for any of these tournaments. Players receive an initial stake of 100 chips. There is no limit to the number of rebuys ($2 for additional 100 chips). For each tournament, players have one week to achieve the highest score. Intertops Casino Classic was launched by Intertops Casino last fall, giving players another 200 games to enjoy including popular favourites Agent Cash and Amanda Panda. All Intertops Casino, Poker and Sportsbook players can play games via their existing Intertops account. No further registration is necessary.